777 Burrard, Heritage Building in Vancouver. 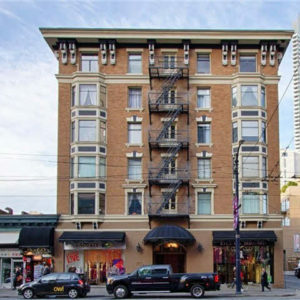 777 Burrard, is a heritage building that was built back in 1914. It was used previously as a rental building but had become a condominium building with 51 units. With so many years of wear and tear on this building’s plumbing system, they were in urgent need of work, with pinholes and leaks of every variety known to plumbers, showing up frequently in both domestic water and waste water pipes. For 777 Burrard, it was time for a repipe of the domestic water and waste water pipes. CuraFlo’s repipe and rehabilitation crew got to work in January 2018, taking out old corroded and leaking pipes and replacing them with brand new PEX Pipes for the domestic water pipes and new cast iron pipes for waste water pipes. CuraFlo designed a new plumbing system to current code, specifically suited for this building’s needs, using the best materials available for this specific project, engineered to resist corrosion from Vancouver’s notoriously aggressive water. Restoring the pipe system with as little intrusion into the resident’s lives was the number one goal for the CuraFlo crew. CuraFlo, a repipe and rehabilitation contractor, takes great pride in restoring historic buildings, that are a treasure and should be preserved as a part of our heritage and history.